photo by Esther Lin / SHOWTIME – Errol Spence Jr has been seen as the cream of the crop of the 2012 United States Olympic Boxing Team by the boxing world. That much is certain. However, what’s uncertain is how he will fair against higher level competition. This is a test that all prospects must face at some point in their career, yet Errol is electing to take on the scrappy veteran Ronald Cruz in a ten round bout at the Hard Rock Casino in Las Vegas this Friday, June 27th. The welterweight division in boxing may be the hottest most competitive divisions in boxing in a few years from now, and several names are eyeing a position to explode as the figurehead of the division. Errol Spence is a recipient of good timing as he has the skill-set and upward ceiling to improve to incredible heights in a post Mayweather period.The attributes continue to build, as he possesses the power, speed, ring IQ to defeat his opponents. Not to mention he is a southpaw. Great sparring can turn a good fighter into a great fighter. Errol Spence is no stranger to facing the best in the world. His amateur pedigree is not overlooked by any means. But his pro experience is better than most fighters in the game today. Spence has had numerous sparring sessions at the Mayweather Boxing Club preparing Floyd Mayweather for his 2013 bout with welterweight contender, and fellow southpaw Robert Guerrero. This upcoming Friday several questions about both fighters will be answered. 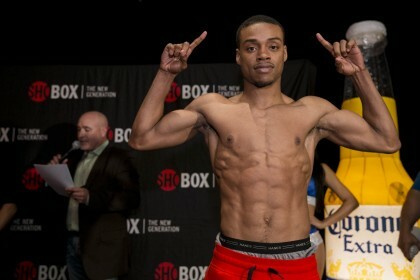 Will Errol Spence be able to look like a future name in the welterweight division? Will Ronald Cruz be able to score the biggest victory in his career? Will Errol Spence be the first fighter to stop Ronald Cruz? The fight is signed, the fighters are nearing readiness, the only thing to do now is to wait idly see what happens.